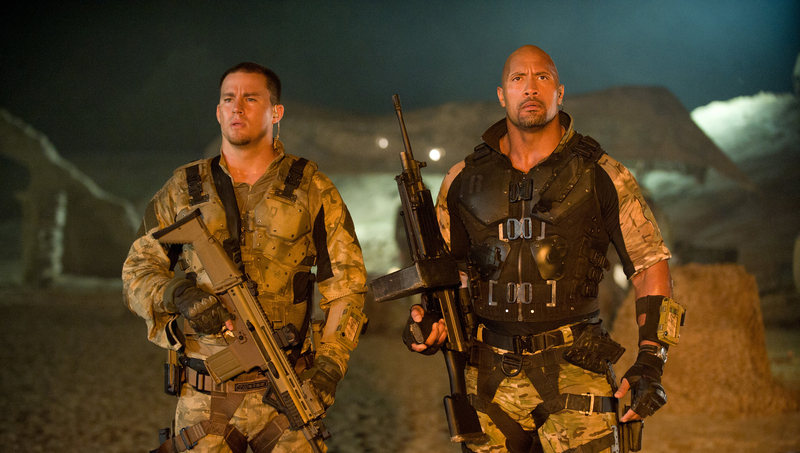 (l-r) Channing Tatum and Dwayne Johnson stars in “G.I. JOE: RETALIATION.” ©Paramount Pictures. CR: Jaimie Trueblood. HOLLYWOOD—Audiences at “Hansel & Gretel: Witch Hunters” will be treated to a special four-minute sneak peek of “G.I. Joe: Retaliation,” Paramount Pictures, the distributor of both films announced Wednesday. This first-look at the film will play across the globe beginning January 24 and run throughout “Hansel & Gretel’s” theatrical engagement. “G.I. Joe: Retaliation” is based on the best-selling Hasbro characters, and is a follow-up to the 2009 hit action drama “G.I. Joe: The Rise of the Cobra,” which starred Channing Tatum, Dennis Quaid and Ray Park. It grossed more than $300 million worldwide. In the sequel, the G.I. Joes are not only fighting their mortal enemy Cobra, they are forced to contend with threats from within the government that jeopardize their very existence. Tatum and Park reprise their roles and also stars D.J. Cotrona, Byung-hun Lee, Adrianne Palicki, Jonathan Pryce, Ray Stevenson, Elodie Yung, with Bruce Willis and Dwayne Johnson. Directed by Jon M. Chu, and produced by Lorenzo di Bonaventura and Brian Goldner of Hasbro, “G.I. Joe: Retaliation” is written by Rhett Reese and Paul Wernick, based on Hasbro’s G.I. Joe characters. “G.I. Joe: Retaliation” hits theaters March 29. “Hansel & Gretel: Witch Hunters” stars Jeremy Renner and Gemma Arterton as the grown up versions of the classic fairy tale characters, who, after getting a taste for blood as children, become the ultimate vigilantes, hell bent on retribution. Unbeknownst to them, the brother and sister have become the hunted, and must face an evil far greater than witches. In addition to Renner and Arterton, the film stars Famke Janssen and Peter Stormare. The action-packed fantasy is written and directed by Tommy Wirkola and produced by Will Ferrell, Adam McKay, Kevin Messick and Beau Flynn. It opens January 24.